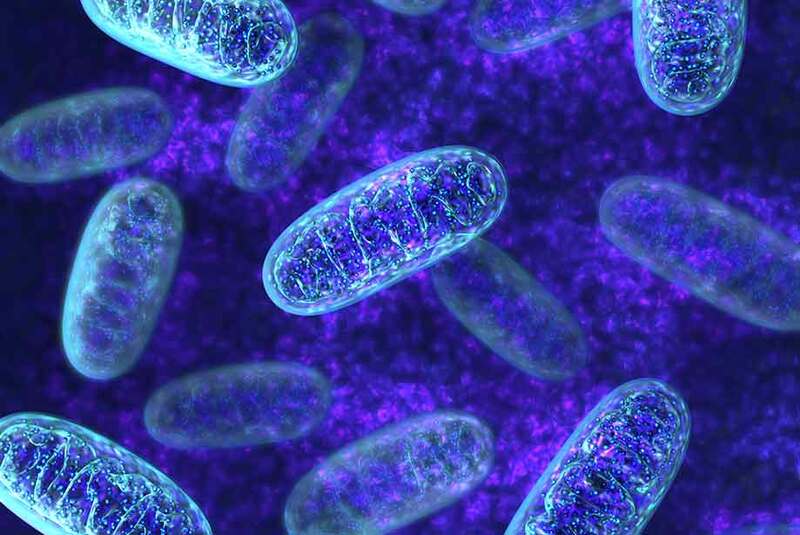 Mitochondria are highly dynamic, double-membrane bound organelles with a primary role in the production of ATP, eukaryotic cells’ bio-energetic currency. Aside from their role as the “powerhouse” of the cell, the mitochondria are also involved in the fine-tuned regulation of cellular apoptosis. Given that mitochondria are present in most cells, their dysfunction is often implicated in a broad range of diseases making it an attractive area of research to better understand the mitochondria’s role in pathologies. Enzo Life Sciences offers a comprehensive product portfolio for Oxidative Stress including mitochondrial dysfunction and free radical detection. Levels of available oxygen in the cell have been shown to influence cellular processes and physiology and have since been considered one of the most informative measures to evaluate mitochondrial function. Decreases in oxygen levels have been implicated in mitochondrial dysfunction in a number of disease states (cancer, obesity, neuro-degeneration, ischemia, metabolic perturbations, etc.) making it one of several attractive parameters to fully characterize mitochondrial dysfunction. To assist researchers in the study of oxygen levels extracellularly and intracellularly, Enzo Life Sciences’ offers two products with the ability to study oxygen levels in either context, individually or simultaneously, via multiplexing. The MITO-ID® Extracellular O2 Sensor Probe is a phosphorescent oxygen sensitive reagent enabling high throughput and real time oxygen consumption readout. Used as the component of an oxygen consumption assay, MITO-ID® Extracellular O2 Sensor Probe is quenched by molecular oxygen in a non-chemical, reversible manner (probe signal intensity increases with decreased oxygenation or probe signal intensity decreases with increased oxygenation/percentage oxygenation). Probe signal can be converted to absolute oxygen concentrations or percentage oxygen. The addition of a suitable oil layer, as contained in our MITO-ID® Extracellular O2 Sensor Kit and our MITO-ID® Extracellular O2 Sensor Kit (High Sensitivity), is required to limit back diffusion of ambient oxygen. 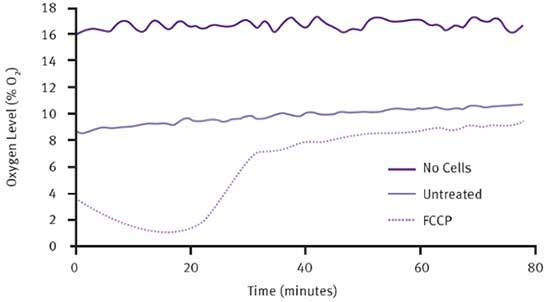 Below are extracellular oxygen consumption rates (OCRs) being measured in untreated and treated HepG2 cells (Figure 1); Across 80 minutes, signal intensity increases as O2 consumption decreases in the untreated group of HepG2 cell. 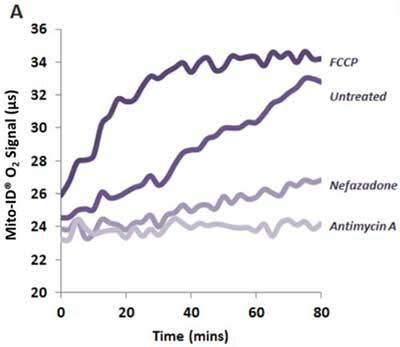 The differing effects with respect to the untreated group are demonstrated after applying differing drug treatments (FCCP, Nefazadone, Antimycin A) resulting in differing levels of extracellular O2 consumption across each group. Figure 1. Kinetic oxygen consumption profiles of Cor.4U® cardiomyocytes are detected using the MITO-ID® Extracellular O2 Sensor Kit. Cor.4U® cells were seeded at 40,000 cells/well on fibronectin coated plates and cultured for 4-5 days prior to measurement. Treatments shown are FCCP (1.25μM), Antimycin A (1 μM) and Nefazadone (1.56 μM) versus untreated vehicle control sample, and show increase/decrease effect on O2 consumption. Additionally, Enzo Life Sciences offers a MITO-ID® Intracellular O2 Sensor Probe, which is a proprietary oxygen-sensitive cell-penetrating nanoparticle probe capable of real-time quantification of intracellular and pericellular oxygen concentration. The MITO-ID® Intracellular O2 Sensor Probe fluorophore is chemically stable and inert and is taken up by cells during an overnight loading period. Oxygen quenches the phosphorescent emission of the probe, such that the measured signal is proportional to intracellular oxygen concentration, thereby allowing for real-time monitoring of intracellular oxygen levels. The majority of in vitro studies culture and study cells at ambient oxygen and ignore the presence of the oxygen gradient between the atmosphere and the medium and between the medium and the intracellular cell environment in assessments of oxygen levels in samples. Below (Figure 2), we provide an example of MITO-ID® Intracellular O2 Sensor Probe being used to measure the effect of drug treatment on cellular oxygenation. For more information, please see our application note. Figure 2. Measuring the effect of drug treatment on cellular oxygenation, with HepG2 3D RAFT™ structures using the MITO-ID® Intracellular O2 Sensor Probe at 21% applied oxygen. FCCP, is a mitochondrial uncoupler, which at first demonstrates a decline in intracellular O2 levels followed by a dramatic increase in O2 levels from 20-30 minutes, which slows down after 30 minutes. During this time, the untreated cells maintain the same intracellular O2 levels. Both probes are capable of operating on a 96-or-384 well microplate reader assay format, allowing for multiplexing of these probes to simultaneously profile internal and external oxygen levels as they pertain to mitochondrial dysfunction. Dual-time resolved measurements assess alterations in glucose metabolism and mitochondrial dysfunction. Through these assessments, it has been shown that mitochondrial toxins (electron transport inhibitors) disrupt or completely prevent aerobic ATP generation. The cellular response to this disruption of aerobic ATP production is a subsequent increase in anaerobic, glycolytic ATP production, to attempt to counterbalance the deficiency in ATP production from disrupted oxidative phosphorylation. However, a byproduct of this increase in glycolytic ATP production is increased acidification. Lactic acid is the main contributor to this extracellular acidification (ECA). Observing increases in acidification can be used as a confirmatory metric when investigating drug-induced mitochondrial dysfunction. For the assessment of extracellular pH changes in samples, Enzo Life Sciences offers the MITO-ID® Extracellular pH Sensor Kit which provides an easy “mix and measure” assay which is optimized to detect changes in pH (extracellular acidification) from cell populations using a 96/384 well plate system. The probe phosphorescence signal is modulated by pH such that increased acidifications cause a proportional increase in phosphorescence signal intensity. In-house, in the same sample population of HepG2 cells, we have demonstrated varying rates of acidification, pending on exposure to differing compounds (Antimycin, Okamate, 2-Deoxyglucose) versus an untreated group using the MITO-ID Extracellular pH Sensor Kit’s probe (Figure 3A and B). For more information about our pH probes please check out our application note. Figure 3. A) Acidification profiles of HepG2 cells illustrating the effect of compound drug treatment. B) Analysis of acidification rates allows the effect of drug treatment to be conveniently assessed. Mitochondrial function is an important parameter in assessing cytotoxicity as changes in mitochondrial function are a hallmark of cellular toxicity. Therefore, cell-based assays have been developed to monitor aspects of mitochondrial function such as membrane potential, calcium flux or the presence of reactive oxygen species, in order to clarify the role of mitochondria in drug-induced toxicity. The MITO-ID® Membrane Potential Detection Kit contains a cationic carbocyanine dye that fluoresces either green or orange, depending on membrane potential status. In healthy, energized cells, the MITO-ID® Membrane Potential reagent is present in the cytosol as a green-fluorescent monomer initially but accumulates as orange-fluorescent aggregates in the mitochondria. However, in cells with compromised mitochondrial membrane potential, the MITO-ID® Membrane Potential reagent exists primarily as green-fluorescent monomers throughout the cytosol without any orange fluorescence in the mitochondria. In comparison to the traditional carbocyanine dye, JC-1, it is at least 10-fold more sensitive to membrane potential loss (Figure 4). Furthermore, this dye provides better photo stability while in-use to produce higher quality visualization of MMP fluctuation in your sample while minimizing the presence of non-specific assay artifacts (Figure 5). Figure 4. 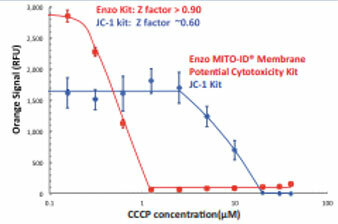 Using MITO-ID® Membrane Potential dye was shown to decrease as a function of CCCP concentration (decrease in orange signal). MITO-ID® Membrane Potential dye is at least 10-fold more sensitive to mitochondrial potential loss than commonly used dye, JC-1. High Z-factor (≥0.9) obtained using the MITO-ID Membrane Potential dye arises from the no-wash protocol. Figure 5. The mitochondria of HeLa cells were stained with MITO-ID® Membrane Potential reagent, and visualized by epifluorescence microscopy. Orange fluorescent aggregates are localized in the mitochondria (Orange channel), while green fluorescent monomers mainly stain the cytosol (FITC channel). The MITO-ID® Membrane Potential Cytotoxicity Kit measures fluctuations in mitochondrial membrane potential (MMP) utilizing a cationic dual-emission dye that exists as green fluorescent monomers in the cytosol, and accumulates as orange fluorescent J-aggregates in the mitochondria. Mitochondria having a low membrane potential will demonstrate low concentrations of dye aggregates and will exhibit green fluorescence while more highly polarized mitochondria will exhibit orange-red fluorescence. Cells exhibit a shift from orange to green fluorescence as mitochondrial function becomes increasingly compromised. Defects in electron transfer across the mitochondrial membranes can cause electrons to accumulate on the ETC complexes resulting in reactive oxygen species (ROS) production. Briefly, reactive oxygen species (ROS) are a group of highly unstable molecules which include H2O2, NO, and O2, which have free radical electrons capable of reacting with free oxygen species and contributes to mitochondrial damage in a range of pathologies. Mitochondrial ROS production can lead to oxidative damage to mitochondrial proteins, membranes and DNA which limit the mitochondria’s ability to produce ATP and maintain its functional roles in metabolic processes such as the Kreb’s cycle, fatty acid oxidation and iron metabolism. To aid in the study of mitochondrial ROS production, Enzo Life Sciences’ ROS-ID® products are able to detect reactive oxygen and nitrogen (ROS/RNS) and superoxide (O2-) species. ROS-ID® Total ROS Detection Kit is designed to enable real time detection of total reactive oxygen and/or nitrogen species (ROS/RNS) levels and to determine superoxide production in live cells using fluorescence microscopy and/or flow cytometry. The kit comes with the Oxidative Stress Detection Reagent (Green) which is a non-fluorescent, cell-permeable total ROS detection dye that reacts directly with reactive species such as hydrogen peroxide, peroxynitrite and hydroxyl radicals, yielding a green fluorescent signal proportional to the cellular production of different ROS/RNS types. This kit also comes with the Superoxide Detection Reagent (Orange), which is a cell-permeable probe that reacts specifically with superoxide, generating an orange fluorescence to detect the presence of superoxides. Together, this enables the end-user to measure total ROS/RNS levels for at least 200 microscopy assays or 50 flow cytometry assays using live cells. Additionally, we have our ROS-ID® ROS/RNS Detection Kit and ROS-ID® Superoxide Detection Kit which are each optimized to specifically measure ROS/RNS or Superoxide levels, respectively. Loss of cellular ATP is a typical byproduct in molecular events that disrupt mitochondrial function. Therefore, probing your samples to study their ATP levels may be necessary to understand the extent of mitochondrial dysfunction. Enzo provides the ApoSENSOR™ Cell Viability Assay Kit which utilizes a bioluminescent detection system to rapidly screen for ATP levels in mammalian cells. The assay utilizes the enzyme luciferase to catalyze the formation of light from ATP and luciferin. The resultant light intensity that is produced from the reaction can be measured using a beta counter or luminometer. We provide an ATP standard which can be used to generate a standard curve to help back-calculate the amount of ATP in samples. This assay demonstrates a high sensitivity that is capable of detecting ATP in 10-100 mammalian cells per well in each run. Furthermore, it has been optimized for high throughput screening and can be a fully automatic assay. Enzo Life Sciences offers a broad range of products for your Cellular Analysis research needs. As Scientists Enabling Scientists, we realize the value in providing relevant information to our customers working in the fields of life sciences, drug development and clinical research. We are happy to provide simple yet useful tips and guidance for your research needs. Please check out our successful research tips, application notes, or contact our Technical Support Team for further assistance.